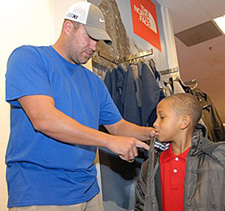 Steelers players took the kids shopping at Macy’s at Ross Park Mall as a part of Project Bundle-Up, a Salvation Army program that provides winter outerwear for needy children in Southwestern Pennsylvania. The kids were able to select a winter coat, as well as a hat, scarf and gloves, and in many cases players purchased extra items for them, from socks to sweatshirts, bringing plenty of joy to the youngsters. You can read more from Ms. Varley about the event here. You can see the photo gallery here. Ben and his teammates “weighed in” on Troy’s new wax figure that was unveiled today at Madame Tussaud’s Wax Museum in New York.